Nico Rosberg infuriated Fernando Alonso during the Bahrain GP weekend by nearly squeezing him off the track, claiming it as a defensive move. Alonso spent the following week, making a comment to the press about how driver conduct in Formula 1 needs to improve. A fact that personally, I think holds water. At least when concerning driver conduct, I generally agree with Alonso’s. 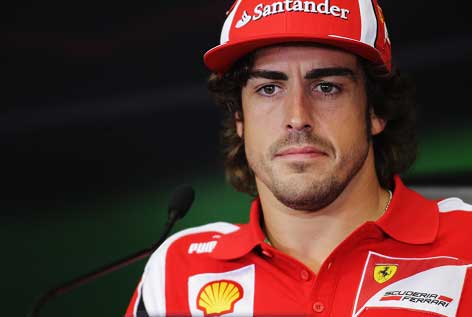 (I’ve never thought that I would be one to agree with a comment that came from Alonso in the past!) Although my personal impression of Alonso has changed over the last few years, I knew eventually someone would make a jab- reference to one of Fernando’s ‘less than polite’ past actions. You don’t become a two-time world champion by just being nice all the time. Who would have thought that the burn would have come from Sebastian Vettel! Check out this video during today’s FIA press conference, and Vettel’s wicked Alonso impression. Check out the video before it gets tagged. This entry was posted in Formula 1 and tagged Alonso, F1, Rosber, Vettel. Bookmark the permalink. ← |Video| -Who can tell us more about Radical Series Racing?